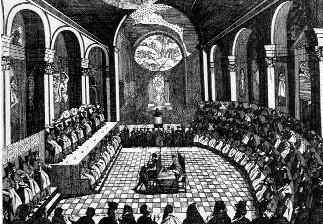 The Council of Trent was the 19th Ecumenical Council of the Roman Catholic Church. Considered one of the Church's most important councils, it convened in Trent for three periods between December 13, 1545, and December 4, 1563, as a response to the Protestant Reformation. It clearly specified Catholic doctrine on salvation, the sacraments, and the Biblical canon, answering all Protestant disputes. It entrusted to the Pope the completion of some sections of its work, as a result of which Pope Pius V issued in 1566 the Roman Catechism, in 1568, a revised Roman Breviary, and in 1570, a revised Roman Missal, thus initiating what since the twentieth century has been called the Tridentine Mass (from the city's Latin name Tridentum), and Pope Clement VIII issued in 1592, a revised edition of the Vulgate. Charles V, Holy Roman Emperor favored the calling of a council, but the popes were generally reluctant, and Francis I of France also raised difficulties. The council was first delayed and sometimes suspended because of resistance from the popes and revolt against the emperor. Pope Paul III finally summoned the council in 1537, for Mantua, which was blocked by France, and in 1538 for Vicenza, which was not supported by the Emperor. A 1542 convocation for Trent finally took effect in 1545, and the Council convened for three periods: 1545-1547, 1551-1552, and 1562-1563, with the first suspension caused by an epidemic at Trent and the second by a revolt against the Emperor and the personal opposition of Pope Paul IV. The Council of Trent was the most impressive embodiment of the ideals of the Counter-Reformation. It would be over 300 years until the next Ecumenical Council. In reply to the Papal bull, Exsurge Domine, of Pope Leo X (1520), Martin Luther burned the document and appealed for a general council. In 1522, German diets joined in the appeal, with Charles V seconding and pressing a council for means of reunifying the Church and settling the Reformation controversies. Pope Clement VII (1523–34) was vehemently against the idea of a council, agreeing with Francis I of France. After Pope Pius II in his bull, Execrabilis (1460) and his reply to the University of Cologne (1463) set aside the theory of the supremacy of general councils laid down by the Council of Constance, it was the papal policy to avoid councils. Pope Paul III (1534–49)—seeing that the Protestant Reformation was no longer confined to a few preachers, but had won over various princes, particularly in Germany, to its ideas—desired a council. Yet, when he proposed the idea to his cardinals, it was unanimously opposed. Nonetheless, he sent nuncios throughout Europe to propose the idea. Paul III issued a decree for a general council to be held in Mantua, Italy, to begin May 23, 1537. Martin Luther wrote the Smalcald Articles in preparation for the general council. The Smalcald Articles were designed to sharply define where the Lutherans could and could not compromise. However, the council was delayed until 1545, and convened right before Luther's death. Unable, however, to resist the urging of Charles V, the pope, after proposing Mantua as the place of meeting, convened the council at Trento (at that time a free city of the Holy Roman Empire under a prince-bishop), on December 13, 1545; the Pope's decision to transfer it to Bologna in March 1547, on the pretext of avoiding a plague failed to take effect and the Council was indefinitely prorogued on September 17, 1549. Reopened at Trent on May 1, 1551, by convocation of Pope Julius III (1550–1555), it was broken up by the sudden victory of Maurice, Elector of Saxony over the Emperor Charles V and his march into Tyrol on April 28, 1552. There was no hope of reassembling the council while the very anti-Protestant Paul IV was Pope. The council was reconvened by Pope Pius IV (1559–65) for the last time, meeting from January 18, 1562, and continued until its final adjournment on December 4, 1563. It closed with a series of ritual acclamations honoring the reigning Pope, the Popes who had convoked the Council, the emperor and the kings who had supported it, the papal legates, the cardinals, the ambassadors present, and the bishops, followed by acclamations of acceptance of the faith of the Council and its decrees, and of anathema for all heretics. The history of the council is thus divided into three distinct periods: 1545–49, 1551–52, and 1562–63. During the second period, the Protestants present asked for renewed discussion on points already defined and for bishops to be released from their oaths of allegiance to the Pope. When the last period began, all hope of conciliating the Protestants was gone and the Jesuits had become a strong force. The number of attending members in the three periods varied considerably. The council was small at the beginning. It increased toward the close, but never reached the number of the first ecumenical council at Nicaea, (which had 318 members), nor of the First Vatican Council (which numbered 744). The decrees were signed by 255 members, including four papal legates, two cardinals, three patriarchs, twenty-five archbishops, 168 bishops, two-thirds of whom were Italians. The Italian and Spanish prelates were vastly preponderant in power and numbers. At the passage of the most important decrees not more than sixty prelates were present. 1. To condemn the principles and doctrines of Protestantism and to define the doctrines of the Catholic Church on all disputed points. It is true that the emperor intended it to be a strictly general or truly ecumenical council, at which the Protestants should have a fair hearing. He secured, during the council's second period, 1551-53, an invitation, twice given, to the Protestants to be present and the council issued a letter of safe conduct (thirteenth session) and offered them the right of discussion, but denied them a vote. Melanchthon and Johannes Brenz, with some other German Lutherans, actually started in 1552, on the journey to Trent. Brenz offered a confession and Melanchthon, who got no farther than Nuremberg, took with him the ironic statement known as the Confessio Saxonica. But the refusal to give to the Protestants the right to vote and the consternation produced by the success of Bornfeld in his campaign against Charles V in 1552, effectually put an end to Protestant cooperation. 2. To effect a reformation in discipline or administration. This object had been one of the causes calling forth the reformatory councils and had been lightly touched upon by the Fifth Council of the Lateran under Pope Julius II and Pope Leo X. The alleged corruption in the administration of the Church was one of the secondary causes of the Reformation. Twenty-five public sessions were held, but nearly half of them were spent in solemn formalities. The chief work was done in committees or congregations. The entire management was in the hands of the papal legate. The liberal elements lost out in the debates and voting. The council abolished some of the most notorious abuses and introduced or recommended disciplinary reforms affecting the sale of Indulgences, the morals of convents, the education of the clergy, the non-residence of bishops (also bishops having plurality of benefices, which was fairly common), and the careless fulmination of censures and forbade dueling. Although evangelical sentiments were uttered by some of the members in favor of the supreme authority of the Scriptures and justification by faith, no concession whatever was made to Protestantism. 3. The church's interpretation of the Bible was final. Any Christian who substituted his or her own interpretation was a heretic. Also, the Bible and Church Tradition (not mere customs but the ancient Tradition that made up part of the Catholic faith) were equally authoritative. 4. The relationship of faith and works in salvation was defined, following controversy over Martin Luther's doctrine of "justification by faith alone." 5. Other Catholic practices that drew the ire of reformers within the Church, such as Indulgences, pilgrimages, the veneration of saints and relics, and the veneration of the Virgin Mary were strongly reaffirmed. The doctrinal decisions of the council are divided into decrees (decreta), which contain the positive statement of the conciliar dogmas, and into short canons (canones), which condemn the dissenting Protestant views with the concluding "anathema sit" ("let him be anathema"). Justification (sixth session) was declared to be offered upon the basis of faith and good works as opposed to the Protestant doctrine of faith alone and faith was treated as a progressive work. The idea of man being utterly passive under the influence of grace was also rejected. The greatest weight in the Council's decrees is given to the sacraments. The seven sacraments were reaffirmed and the Eucharist pronounced to be a true propitiatory sacrifice as well as a sacrament, in which the bread and wine were consecrated into the Eucharist (thirteenth and twenty-second sessions). The term "transubstantiation" was used by the Council, but the specific Aristotelian explanation given by Scholasticism was not cited as dogmatic. Instead, the decree states that Christ is "really, truly, substantially present" in the consecrated forms. The sacrifice of the Mass was to be offered for dead and living alike and in giving to the apostles the command, "do this in remembrance of me," Christ conferred upon them a sacerdotal power. The practice of withholding the cup from the laity was confirmed (twenty-first session) as one which the Church Fathers had commanded for good and sufficient reasons; yet in certain cases the Pope was made the supreme arbiter as to whether the rule should be strictly maintained. In the decrees on marriage (twenty-fourth session) the excellence of the celibate state was reaffirmed, concubinage condemned and the validity of marriage made dependent upon its being performed before a priest and two witnesses—although the lack of a requirement for parental consent ended a debate that had proceeded from the twelfth century. In the case of a divorce, the right of the innocent party to marry again was denied so long as the other party is alive, even if the other may have committed adultery. In the twenty-fifth and last session, the doctrines of purgatory, the invocation of saints and the veneration of relics were reaffirmed, as was also the efficacy of indulgences as dispensed by the Church according to the power given her, but with some cautionary recommendations. On adjourning, the Council asked the supreme pontiff to ratify all its decrees and definitions. This petition was complied with by Pope Pius IV, January 26, 1564, in the papal bull, Benedictus Deus, which enjoins strict obedience upon all Catholics and forbids, under pain of excommunication, all unauthorized interpretation, reserving this to the Pope alone and threatens the disobedient with "the indignation of Almighty God and of his blessed apostles, Peter and Paul." Pope Pius appointed a commission of cardinals to assist him in interpreting and enforcing the decrees. The Index librorum prohibitorum was announced 1564 and the following books were issued with the papal imprimatur: the Profession of the Tridentine Faith and the Tridentine Catechism (1566), the Breviary (1568), the Missal (1570) and the Vulgate (1590 and then 1592). The decrees of the council were acknowledged in Italy, Portugal, Poland and by the Catholic princes of Germany at the Diet of Augsburg in 1566. Philip II of Spain accepted them for Spain, the Netherlands and Sicily insofar as they did not infringe the royal prerogative. In France they were officially recognized by the king only in their doctrinal parts. The disciplinary sections received official recognition at provincial synods and were enforced by the bishops. No attempt was made to introduce it into England. Pius IV sent the decrees to Mary, Queen of Scots, with a letter dated June 13, 1564, requesting her to publish them in Scotland, but she dared not do it in the face of John Knox and the Reformation. The canons and decrees of the council have been published very often and in many languages (for a large list consult British Museum Catalogue, under "Trent, Council of"). The first issue was by P. Manutius (Rome, 1564). The best Latin editions are by J. Le Plat (Antwerp, 1779) and by F. Schulte and A. L. Richter (Leipsig, 1853). Other good editions are in vol. vii. of the Acta et decreta conciliorum recentiorum. Collectio Lacensis (7 vols., Freiburg, 1870-90), reissued as independent volume (1892); Concilium Tridentinum: Diariorum, actorum, epastularum, … collectio, ed. S. Merkle (4 vols., Freiburg, 1901 sqq. ; only vols. i.-iv. have as yet appeared); not to overlook Mansi, Concilia, xxxv. 345 sqq. Note also Mirbt, Quellen, 2d ed, p. 202-255. The best English edition is by J. Waterworth (London, 1848; With Essays on the External and Internal History of the Council). Most of the official documents and private reports, however, which bear upon the council, were made known in the sixteenth century and since. The most complete collection of them is that of J. Le Plat, Monumentorum ad historicam Concilii Tridentini collectio (7 vols., Leuven, 1781-87). New materials were brought to light by J. Mendham, Memoirs of the Council of Trent (London, 1834-36), from the manuscript history of Cardinal Paleotto; more recently by T. Sickel, Actenstücke aus österreichischen Archiven (Vienna, 1872); by JJI von Döllinger (Ungedruckte Berichte und Tagebücher zur Geschichte des Concilii von Trient) (2 parts, Nördlingen, 1876); and A. von Druffel, Monumenta Tridentina (Munich, 1884-97). ↑ Bruce Wetterau, World History (New York: Henry Holt and company, 1994). ↑ F.L. Cross (ed. ), The Oxford Dictionary of the Christian Church (Oxford University Press, 2005, ISBN 978-0-19-280290-3). ↑ Franz Trenkle, Council of Trent. Retrieved January 22, 2008. ↑ Hanover University, Acclamations of the Fathers at the Close of the Council. Retrieved May 28, 2008. Bungener, L.F., and John McClintock (eds.). History Of The Council Of Trent. Kessinger Publishing, LLC, 2007. ISBN 978-0548090169. Cross, F.L. (ed.). The Oxford Dictionary of the Christian Church. Oxford University Press, 2005. ISBN 978-0-19-280290-3. Trent, C. Canons and Decrees of the Council of Trent. Tan Books & Publishers, 1978. ISBN 978-0895550743. Wetterau, Bruce. World History: A Dictionary of Important People, Places, and Events, from Ancient Times to the Present. New York: Henry Holt and Company, 1994. ISBN 978-0805042412. The text of the Council of Trent translated by J. Waterworth, 1848. History of "Council of Trent"
This page was last modified on 11 December 2017, at 20:53.